Home / #BecauseMath, Elections, Obama / Is Voter Fraud a Good Investment? Is Voter Fraud a Good Investment? Today, we’re indulging a conservative fantasy. Let’s examine what it would take to swing the 2012 election with fraudulent votes. The vote in Florida came down to 78,000 votes–a fairly narrow margin. If I were the Obama campaign looking to steal the election, that’s the easiest state to flip. Now, the problem is that penalties for voter fraud are severe–3 1/2 years in jail and a $10,000 fine. But, depending on how I do it, it can be hard to detect. The best way might be to find people who are dead or moved away, but not removed from voter roles, then impersonate them. It wouldn’t be reasonable to get away with it all 78,000 times. You should probably pad that by at least 20%. Let’s say you make 100,000 attempts. Now, imagine you could find people willing to do this 100,000 times and could identify the correct names. It could be the same person several times, but not several thousand times. Probably, you need 10,000 people. Easy enough to find 10,000 true believers to each make 10 attempts. With 100,000 attempts, you’d be wise to assume some of these will be not only thwarted, but reported to the elections commission. If you catch 1 in 100 at $10k/count that’s $7.8M, or 84% of all Obama campaign spending in Florida. 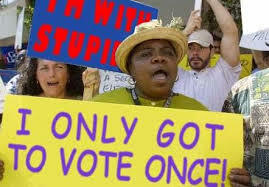 So, if you’re going to use voter fraud to flip an election, you’d better have legions of people willing to go to jail for you and either a mound of cash or a willingness to cancel all your ad buys, signage and get-out-the-vote efforts and go whole hog for voter fraud! Good luck!